Voters who went to the polls last month in the United States' midterm elections can rest assured that their votes were registered and counted properly. "The activity we did see was consistent with what we shared in the weeks leading up to the election," Director of National Intelligence Dan Coats said in a statement late Friday. "Russia, and other foreign countries, including China and Iran, conducted influence activities and messaging campaigns targeted at the United States to promote their strategic interests," he added. "At this time, the intelligence community does not have intelligence reporting that indicates any compromise of our nation's election infrastructure that would have prevented voting, changed vote counts, or disrupted the ability to tally votes," Coats said. President Donald Trump speaks during a roundtable discussion in the Roosevelt Room of the White House, Dec. 18, 2018. "There were no indications at the time of any foreign compromises of election equipment that would disrupt the ability to cast or count a vote," Christopher Krebs, director of the DHS' Cybersecurity and Infrastructure Security Agency, said a week after voters went to the polls. The new report now goes to the U.S. attorney general and to the Department of Homeland Security, which have 45 days to review the findings. Should they concur with the intelligence community's assessment, Russia, China and Iran could be slapped with new sanctions. Additionally, the president's executive order authorizes the State Department and the Treasury Department to add additional sanctions, if deemed necessary. But as in the aftermath of the 2016 election, when the CIA and FBI concluded with "high confidence" that Russia sought to undermine confidence in the U.S. electoral process and help then-candidate Donald Trump win election, gauging the success of the 2018 meddling efforts is difficult. "We did not make an assessment of the impact that these activities had on the outcome of the 2018 election," Coats cautioned in his statement. "The U.S. intelligence community is charged with monitoring and assessing the intentions, capabilities and actions of foreign actors; it does not analyze U.S. political processes or U.S. public opinion." That impact will likely be debated in U.S. political circles, fueled in part by the president's own attacks against the ongoing special counsel investigation into Russia's activities and into possible collusion with Trump's own campaign staff. Trump has repeatedly dismissed the investigation as a "witch hunt." 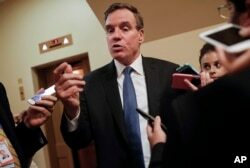 "The Russians did not go away after the 2016 election," Sen. Mark Warner, vice chairman of the Senate Intelligence Committee, said in a statement. Warner, who previously criticized the president's executive order for failing to lay out strong, clear consequences for election meddling, said it was no surprise China and Iran tried to manipulate American voters, and that the problem will only get worse. 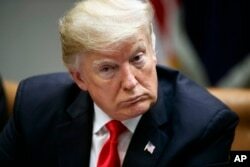 "We're going to see more and more adversaries trying to take advantage of the openness of our society to sow division and attempt to manipulate Americans," he added. 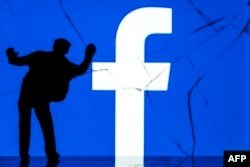 "Congress has to step up and enact some much-needed guardrails on social media, and companies need to work with us so that we can update our laws to better protect against attacks on our democracy." "I don't know that it will be a complete solution," said Sean Kanuck, a former intelligence officer for cyber issues, said when the order was first introduced. "I doubt it will completely change the incentive-cost-benefit analysis of the other side." This photograph taken on May 16, 2018, shows a figurine standing in front of the logo of social network Facebook on a cracked screen of a smartphone in Paris. "The Russians were going to save their best tricks for 2020," said William Carter, deputy director, Technology Policy Program, Center for Strategic and International Studies, predicted in the days before the U.S. midterm elections in November. "They're going to let us chase our tails in 2018 and look for them where they're not," he added.